Staffordshire Bull Terrier originated in England when blood sports (bear and bull baiting and then later dog fighting) were still popular. Descended from Mastiffs, the old Bulldog, and a small terrier, the dogs were known in the mid-1800s as Old Pit Bull Terriers. The dogs that were brought to the U.S. in the mid-1800s developed into taller, heavier-bodied dogs than those that remained in England. The Staffordshire Bull Terrier stands 14 to 16 inches tall and weighs 24 to 38 pounds. These dogs are muscular, yet agile. The head is broad with a short foreface, with half-pricked ears, and round, medium-sized eyes. The body is compact, with a wide chest. The tail is of medium length and is not docked. The coat is short and smooth. Coat colors include red, fawn, black, blue, or brindle, with or without white markings. The coat is easy to maintain; it requires brushing once a week to keep it clean. The coat does shed, though, about once a year. 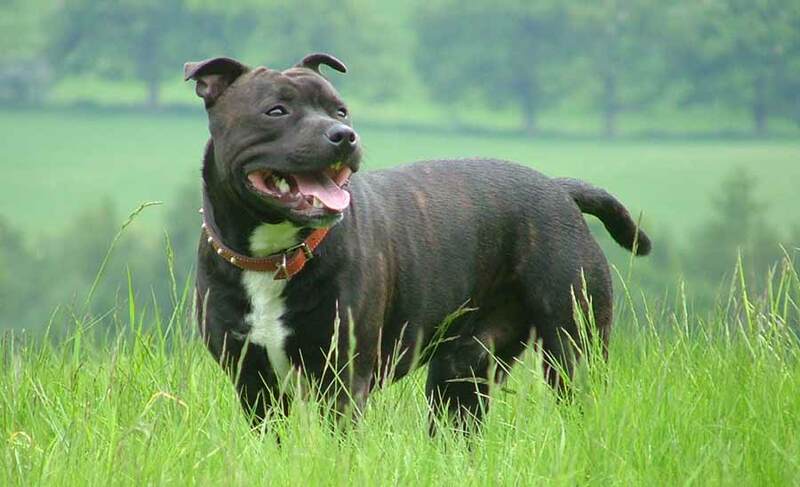 Staffordshire Bull Terrier is an active, athletic dog breed that needs vigorous daily exercise. 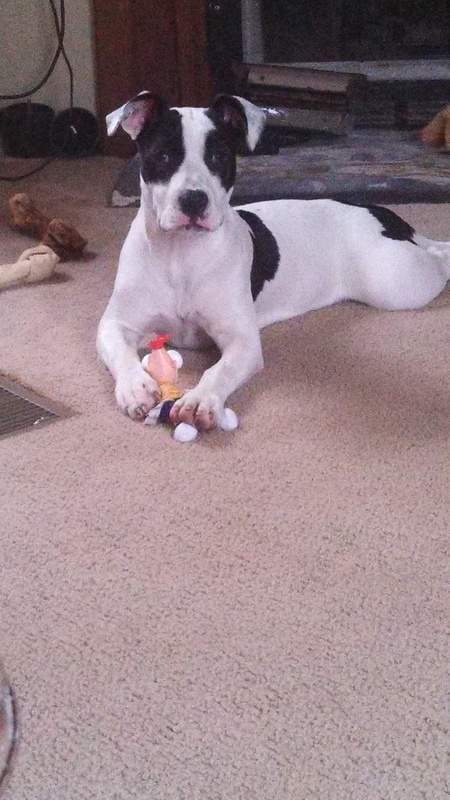 They like to run, train in agility, or chase toys. Walks are great opportunities for socialization but are not enough exercise for a young, healthy Staffordshire Bull Terrier. All off-leash exercise should be within a fenced-in yard, as Staffords have a strong prey drive and many adult Staffordshire Bull Terriers are not good with strange dogs. Training a Staffordshire Bull Terrier requires a balance of firmness (so that the owner can establish control) and leadership yet a light hand, as these dogs can be surprisingly sensitive. At the same time, they can be stubborn. Socialization and training should both begin in early puppyhood. The Staffordshire Bull Terrier does better when she is not left alone for too many hours each day. When bored and lonely, a Staffordshire Bull Terrier can be amazingly destructive when trying to amuse herself. The Staffordshire Bull Terrier dog breed is good with children and will join in with the kids’ games. They can be aggressive to other dogs. Health concerns include hip dysplasia, eye defects, and cleft palate. Share your Staffordshire Bull Terrier story. Note: Upload only Staffordshire Bull Terrier picture or your picture with Staffordshire Bull Terrier below - spammer's ip may be blocked. 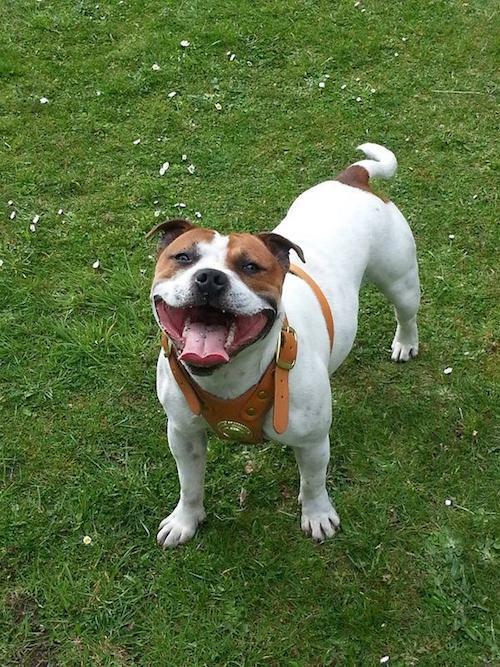 Andy Armitage’s lovely Staffordshire Bull Terrier.